Paula, Cesar, Ariane and Sebastian, bloggers from Growing Up Bilingual had the chance to experience a family vacation at Sunscape Resorts & Spas, and now share with readers their top seven reasons why Sunscape Curacao Resort, Spa & Casino is the perfect destination for families. 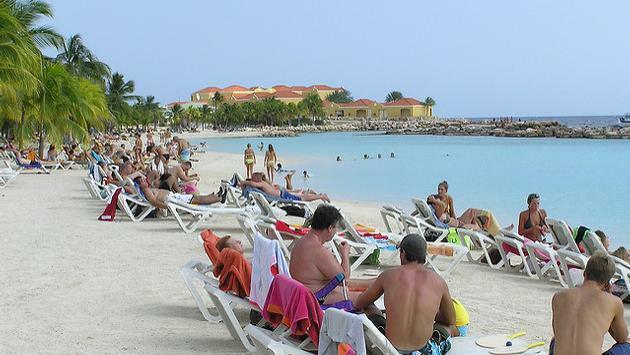 Sunscape Curacao is home to one of the best and the largest beaches on the island. A wave breaker creates a tranquil setting that is a perfect spot for small children to splash around. For adults, the soft white sand and turquoise waters are unbeatable. Plus, beach chairs were always available all day long, and the beach never felt crowded. Since the resort is located in front of the National Underwater Park, which is considered to be one of the best diving sites in the world, the resort-adjacent beach offers plenty of snorkeling opportunities, and with the crystal-clear water, you can see all the way to the bottom. “[Our] kids spent hours each day snorkeling on the beach discovering starfish, crabs and sea urchins in the corals and chasing bright colored fish,” wrote the bloggers. There is snorkeling gear available from the resort, but guests can also rent kayaks, non-motorized water sports and paddle boarding, as well as life vests, all day long. At Sunscape Curacao Resort, Spa & Casino all, all guests have to do is check the daily schedule and there’s bound to be something for everyone to do. No need to plan activities in advance of the trip. From aqua aerobics to ping pong tournaments to dance parties on the beach, there was something going on all day long. Some activities even gave the family an insight into the local culture, such as Papiamento lessons, where they learned basic words of the local language or a colorful carnival parade once a week. There are four swimming pools on site, including the main pool, a quiet pool, a children’s pool and an adult-only whirlpool. The main pool even has a pool bar, so there’s no need to get out of the water to enjoy a frosty cocktail. There’s also a National Geographic and PADI-certified, in-house dive center at the resort where guests can book snorkeling and scuba diving classes and excursions. For kids, the Explorer’s Club offers activities—from arts and crafts to sandcastle competitions to feeding the iguanas—designed specifically for their age group. The programs are based on science, nature and exploration so they are fun and educational. And since the Explorer’s Club staff is Red Cross and CPR certified, adults can enjoy a little, guilt-free “grown-up time” away from the kids as well. With a yearly average high temperature of 88 degrees and an average low temperature of 78 degrees, Curacao has great weather year-round, so it’s never too hot or too cold. Plus, the island’s arid climate means there are very few rainy days. Located just 10 miles from the Hato International Airport, Sunscape Curacao Resort, Spa & Casino is situated on the southern coast of Curacao. The resort is also just two miles from the historic city of Willemstad, a UNESCO World Heritage Site. There’s a free shuttle service to Willemstad twice a day, plus convenient bus service that will take visitors into town. Sunscape Curacao Resort, Spa & Casino is also located close to Mambo Beach, one of the most-entertaining beaches on the island, and it is also a 10-minute walk from the Curacao Sea Aquarium and Dolphin Encounters which are among the favorite family attractions on the island. With every room featuring a picturesque view of the tropical gardens or the ocean, there is no bad place to stay. What’s more, the rooms are spacious with modern décor and come complete with a mini fridge that is re-stocked daily with water, beer, sodas and juice. The bloggers had a two-room suite which connected via a huge, private balcony overlooking the ocean. Sunscape Curaçao offers four a la carte restaurants, a buffet and a café. Whether you’re in the mood for seafood, Italian fare, steak or even Asian hibachi, there are plenty of dining options. Most of the restaurants also include local dishes, so guests can enjoy a taste of criollo Curacaoan cuisine. The restaurants also mostly include the option of eating al fresco, with beautiful views of the ocean. Eating outdoors and watching the sunset over the ocean while the family shared a meal is a particularly favorite memory for the bloggers. The resort also features “food events” during the lunch period, with offerings ranging from BBQ to ceviche. A paella festival, set up next to the pool, with music, freshly made paella and delicious fruit punch was a treasured experience. Cocktails were also a highlight, especially the featured cocktail each day. The kids’ favorite was a frozen chocolate drink from the Café with pineapple and coconut virgin “chichi” that Norma, the bartender, prepared especially for them. The warm, friendly staff was also a standout for the bloggers. For this family of bloggers, their family vacation at Sunscape Curacao Resort, Spa & Casino has become a treasured family vacation. To read more about their experience, visit the Sundrenched blog.